Can it be updated so that the ad actually describes what it is pointing to instead of pointing to something (seemingly) different? Yeah, agree that it should be clearer that we're sending you to Jobs. 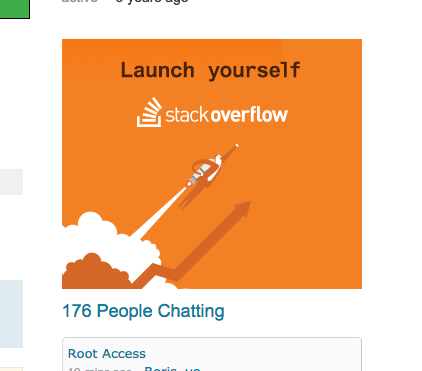 When Jobs lived on a separate site, these ads contained the logo, "Stack Overflow Careers," which (I think) made the destination/message clearer. 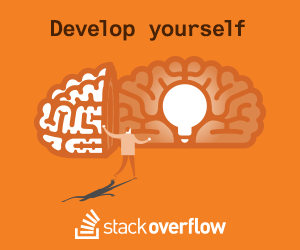 We haven't updated the ad designs for the Jobs-on-Stack Overflow world, though. Thanks for the heads up, and will put the request in. Isn't that the whole point of advertisements? To mislead you a bit? To reach out to that inner desire? To light your fire? I'm not saying this is on purpose or how it was meant to be. It is a personal thing how you perceive an ad. I doubt that feeling misled is a great emotion to have when you click on a ad, no matter what. The ads that are shown are normal ads, not community-ads. The Jobs team "pays" for impressions and they run several variants to see which one attracts more people. I don't think the community has much to say about the quality or intentions of ads. That is the responsibility of the advertiser. Only if it is bad taste which isn't the case here. That you didn't proceed to the checkout to buy a job is probably noted already. If too many users do that, they probably would change stuff. Either the ad, so they attract the correct category of customers, or the page you land on, to make sure you keep shopping. Wouldn't you want that all advertisers have a Meta site to gather direct feedback on their ads ... so they can be improved. Not the answer you're looking for? Browse other questions tagged discussion support jobs advertising .